Avery Weigh-Tronix ZK840 at its simplest can be used as a general high resolution weighing and counting scale. A host of applications are available for use and can be fully customized if required. Popular uses include; Counting with inventory control, Checkweighing and QA management, Balance and density weighing, Grading, and Pick list. At its simplest, the ZK840 can be used as a general high resolution weighing and counting scale. A range of applications, including checkweighing, with inventory control, balance and density weighing, grading and pick list programs is available for use and can be fully customized if required. The ZK840 also offers a fully-configurable solution. The sleek design and user-friendly features provide an ideal platform to build a solution that has been specifically programmed and tailored to your business - with no need to compromise. The 5.3” x 2.75” (135mm x 75mm) touch screen graphic display offers ease of use and extreme durability. Graphics and text such as user prompts result in a more intuitive interface, allowing users to navigate applications using the touch screen. Created to adapt to most inventory control processes, the ZK840 counts and samples components quickly and accurately, speeding up processes and improving efficiencies when counting large numbers of identical parts. With its digital Quartzell transducer, the ZK840 can accurately count small components from a minimum of 10 mg with an accuracy greater than 99.75%. The 1 billion internal count resolution enables the ZK840 to calculate accurate piece weight down to 10 decimal places. The ZK840 also offers a fully-configurable solution, providing an ideal platform to build a solution that has been specifically programmed and tailored to your business - with no need to compromise. The large, low-power-draw screen is designed to ensure that the ZK840 is easy to use. Pre-defined or customer operator messaging and graphics can be displayed on screen, giving users a visual prompt and helping to speed up operations. The addition of a touch screen allows the user to navigate on screen information via a simple and intuitive interface. The ZK840 features highly accurate Quartzell™ weighing technology. With 100,000 divisions (non legal for trade) or 10,000 divisions (legal for trade: OIML, NTEP and Measurement Canada) and a 1 billion internal count resolution, the scale offers unrivaled precision. A robust die-cast clamshell enclosure provides protection for the Quartzell transducer. 1100% overload protection and a spring breakaway mechanism protect the cell from shock and dropped loads, ensuring accuracy and repeatability in even the most extreme conditions. Mounted to the front of the base, the indicator can easily be removed from the base unit for desk or wall mounting. Up to five bases can be linked to the indicator, enabling the system to be expanded for larger system requirements. A high resolution robust digital Quartzell™ counting scale, designed to be fully configurable while also being completely programmable using Lua. Counting scale with built-in inventory control package: Supplied with simple to use, step by step customizable screen prompts to help make counting easy, internal and external inventory control package. Other configurable applications are available for the ZK840 within Ztools. Balance and density formulation: High precision weighing, supplied with a wide range of accessible units of measure, high resolution mode, density formulation, good laboratory practice and percentage weighing. Checkweighing: A wide range of easy to use checkweighing routines to help speed up and monitor busy production lines, line control average checkweighing, average weight adjustment, packs per minute speed operator monitor, line control pack run manager, stored PLU data base with quality control messaging. General high resolution bench scale: Gives balance accuracy for use in industrial environments. Grading: Positive or reverse multi-line grading program with visual graphics showing grading levels, pack per minute and last picked weights. Industrial pick list: Allows multi step picking to be easily processed, supplies clear step by step instructions while working through a picking list which combines counting, checkweighing and QA steps. 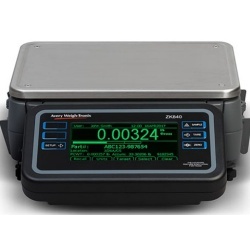 The ZK840 available from authorized Avery Weigh-Tronix distributor Central Carolina Scale, will hold around 3500 PLUs if installed with a Micro SD card. The ZK840 comes as standard with 2.75 x 5.1 inch graphic touch screen display, two bi-directional RS232 ports, three USB, one Ethernet and three I/Os as standard and has the ability to fit a wide range of extra optional cards and I/O externally. Internally, it can be fitted with two option cards. This allows a wide range of peripheral devices to be connected e.g. PCs, printers, scanners, stack lights, up to four extra remote bases (analog and BSQ) and remote displays. Can be fitted with a 32GB Micro SD to further extend the memory. The embedded web server allows the ZK840 to quickly serve up data to your web browser. Fully configurable capacity range to give 100,000d non legal-for-trade or 10,000d NTEP class III (three range multi-interval). AWT25-501983 RS232 base to indicator cable (keyed RJ45 to stripped ends) 10 ft.
AWT25-502071 RS232 base to indicator cable (keyed RJ45 to stripped ends) 25 ft.
AWT25-502072 RS232 base to indicator cable (keyed RJ45 to stripped ends) 50 ft.